Alistair MacLeod. Frame-capture from the TV documentary “Reading Alistair MacLeod” by William D. MacGillivray. 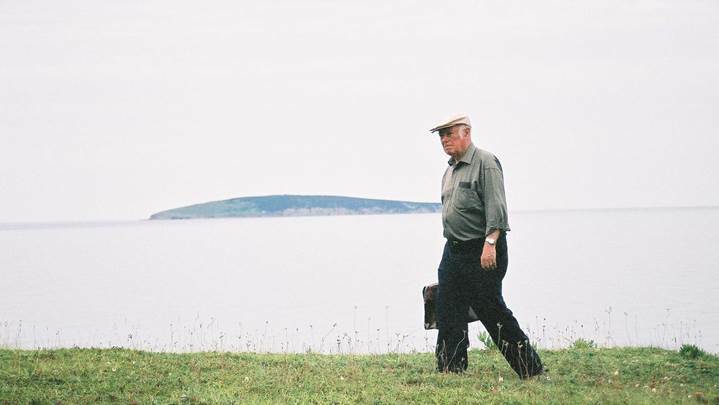 With his little dog Blossom at his side, Gil Macleod, a native of Cape Breton Island who is related to novelist Alistair Macleod, is leading me to his cousin’s writing shack overlooking the Gulf of St. Lawrence. Here is where Macleod penned his classic novel No Great Mischief (1999) about Cape Breton fishermen and miners and their Scottish ancestors who migrated to Nova Scotia in the 18th century. His other works include The Lost Salt Gift of Blood (1976), As Birds Bring Forth the Sun and Other Stories (1986), and Island (2000). Alistair MacLeod (1936-2014) was born in Saskatchewan. His parents moved to Alberta where his father worked in the coal mines, then returned to the MacLeod homestead on Cape Breton Island when Alistair was ten. He grew up in the Dunvegan farmhouse his great-grandfather built in the 1860s. Gil MacLeod’s path to the writing shack leads through a forest of white birches. Across the trail dead trees guard MacLeod’s right to privacy. We step over the downed trees, ford a stream by walking on a log, and emerge on a beach strewn with rocks and boulders. In the near distance on a bluff overlooking the Gulf of St. Lawrence stands the writer’s shack where Alistair Macleod wrote many of his stories. The cabin, or “shack” as Gil calls it, is surrounded by thick ground cover that smells like juniper. The one-room shack has a fecund, creative quality common to writer’s havens. No electricity. No phone. A plywood board for a writing desk. A folding chair. Silence, sunlight and stories waiting to be told. 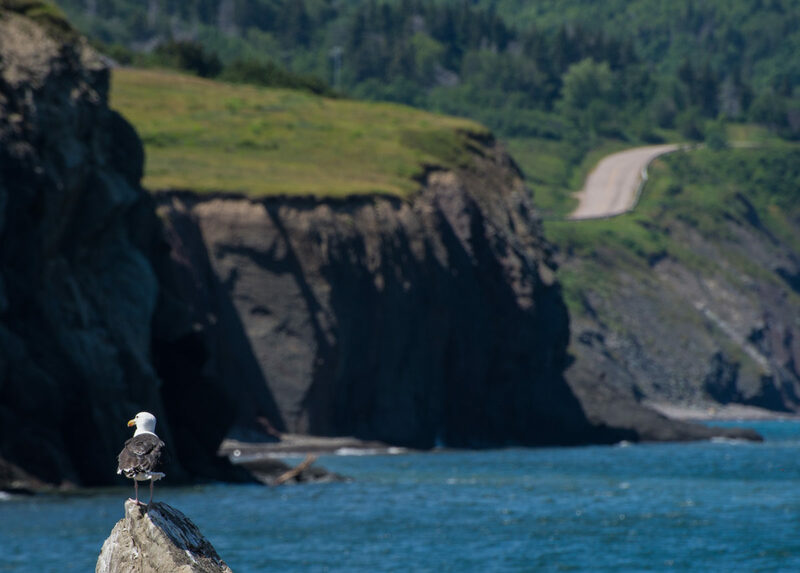 Cape Breton Island. Photo via Flickr. My search for a literary landmark grows legs when I meet MacLeod’s longtime friend, Alice Freeman. “Every time we look at the island [Margaree Island in the Gulf of St. Lawrence] we say that’s the island in No Great Mischief,” says Freeman, speaking at her gift shop on Central Avenue in Inverness. “Remembering the old things can be kind of creepy, actually, but he [MacLeod] told it like it was. One grandfather was rough and tough, and the other was proper. The grandfather on this side liked his drink and the grandmother liked her church. Alistair was a character himself. Always dressed up and wearing his cap.” When asked about the archetypal Calum Ruadh Point, Freeman suggests a likely spot. “There’s a point out from his house. The road is very rough. You’d break an ankle if you tried to go there.” As vague as this description may be, to one who would walk in MacLeod’s footsteps no clue is to be discarded. Learning of my search for a “Calum Ruadh Point” MacDonald recalls a family cemetery on a bluff where a Scottish emigrant left instructions to be buried facing his homeland. MacLeod’s epic novel was based on his Scottish family’s emigration and their struggle to survive as fishermen. Intrigued by MacDonald’s suggestion I set out to find the Scottish gentleman’s grave. Half an hour later I am driving along a high ridge overlooking the beach community of Inverness. The county roads can be confusing but an elderly gentleman in a pickup truck stops to show me the way. In drizzling rain I tramp the woods and fields searching for an over grown cemetery. My search proves fruitless but nevertheless is strangely satisfying. But I’m not done yet. I think of the writer’s shack, bare bones and functional, a ray of sunlight blazing on the compact floor like spontaneous literary combustion. MacLeod’s burst of inspiration could well have happened here, in the writer’s shack. I recall looking out the window and seeing what the author saw whenever he glanced up from his tablet. Alice Freeman’s words reverberate—there’s a point out from his house—his writing shack, she meant, where the salt-stained window reveals Margaree island shining in the sun, and just north of the shack a point of land facing the sea as if rushing out to meet it. Macleod brought these coastal cliffs, coves, and isolated cottages to New York, London, Tokyo, wherever No Great Mischief is being read. Yes, I know, the fictional Calum Ruadh Point was a creation of the author’s fertile imagination, but given the view from his writing shack, until someone sends me in a different direction this fictional landmark of Alistair MacLeod’s Cape Breton Island belongs to me at last. About the author: Lawrence Wells is the author of two historical novels (Doubleday & Co.) and six non-fiction books. In 2014 he was awarded the Faulkner-Wisdom gold medal for narrative non-fiction in the Words and Music Festival, New Orleans. Wells is a contributor of travel stories to the New York Times Syndicate and lives in Oxford, Mississippi.